Their love was contagious and I fell for them immediately at our first meeting. It was a joy and privilege to work with them and create the floral designs for their classic romance-filled wedding. 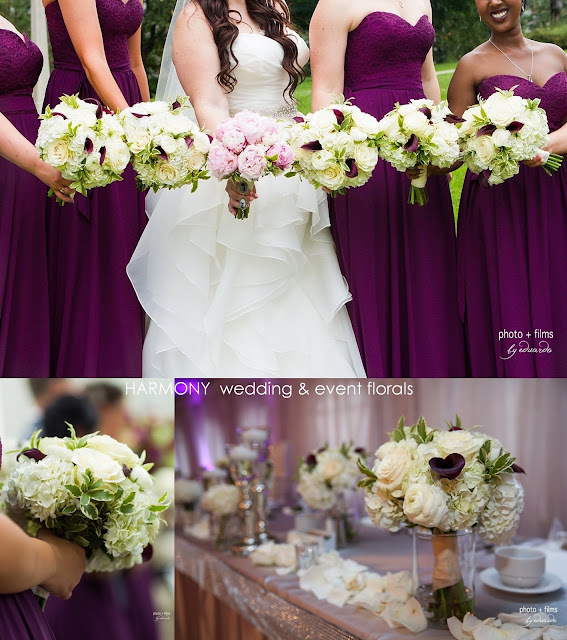 So excited to share these gorgeous photos of Chelsey & Peter's jewel-tone inspired wedding. 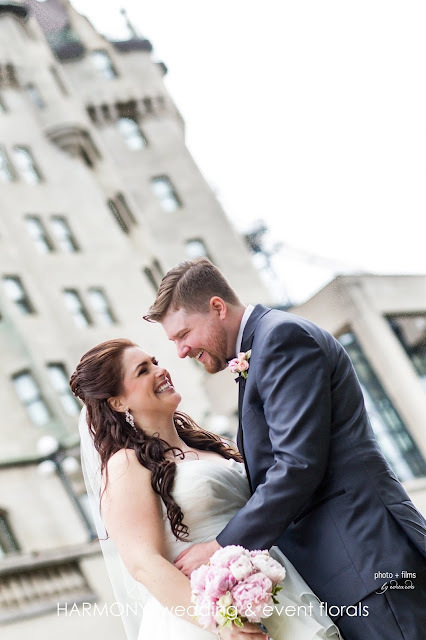 The couple exchanged vows on the rooftop patio at the National Arts Centre on what was the perfect summer's day. 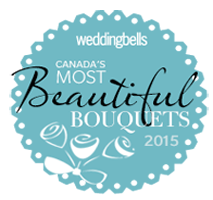 Bouquets overflowing with dutch peonies, roses, calla lilies, ranunculus and hydrangea with accents of bright summer green foliage! 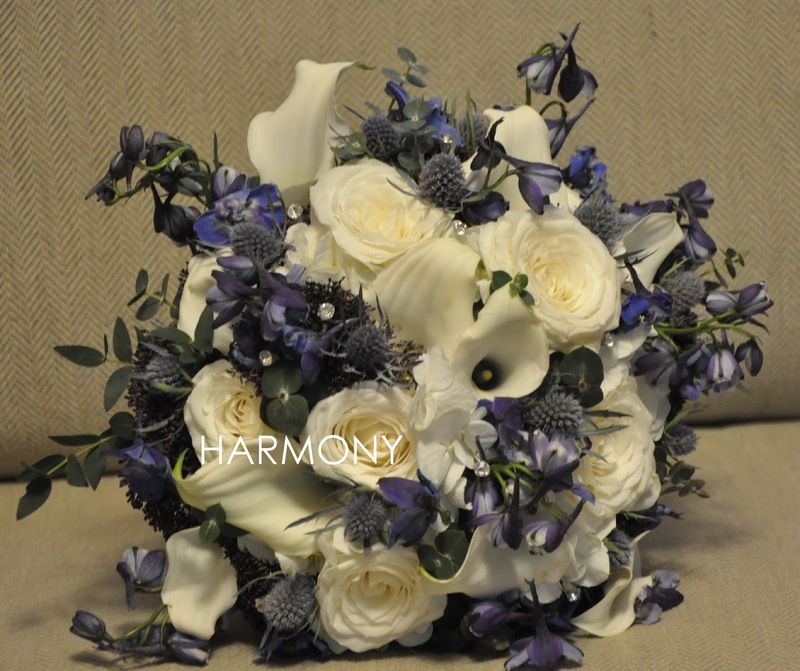 Lovely and vibrant just like the newlyweds. 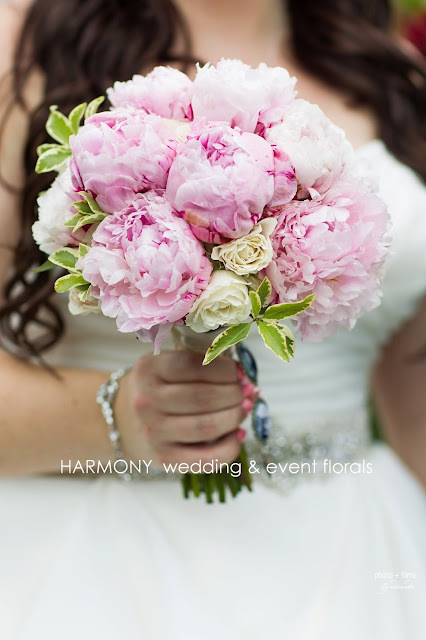 The Dutch peonies definitely were the star floral attraction. They hold a treasured place in Chelsey's heart and a way of having her mother close by on her wedding day. I can't tell you how thrilled I was to source them for her. 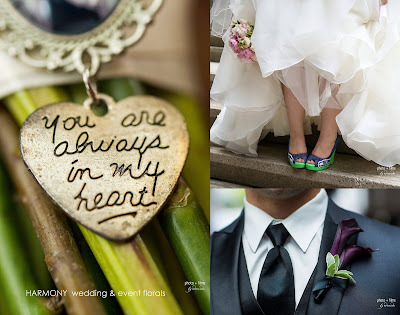 A trio of charms held photos of Chelsey and her mom along with a special message. But Chelsey didn't shy away from showing off her playful side - check out those shoes!!!! Peter with his wedding gift from Chelsey - and who doesn't love the Ghostbusters?! 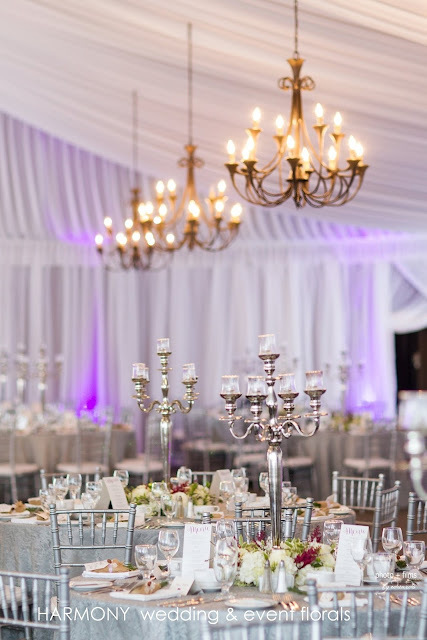 The rooftop tent was decorated with lush florals, chandeliers, candelabras and shimmering tablecloths: it sure didn't feel like a tent! 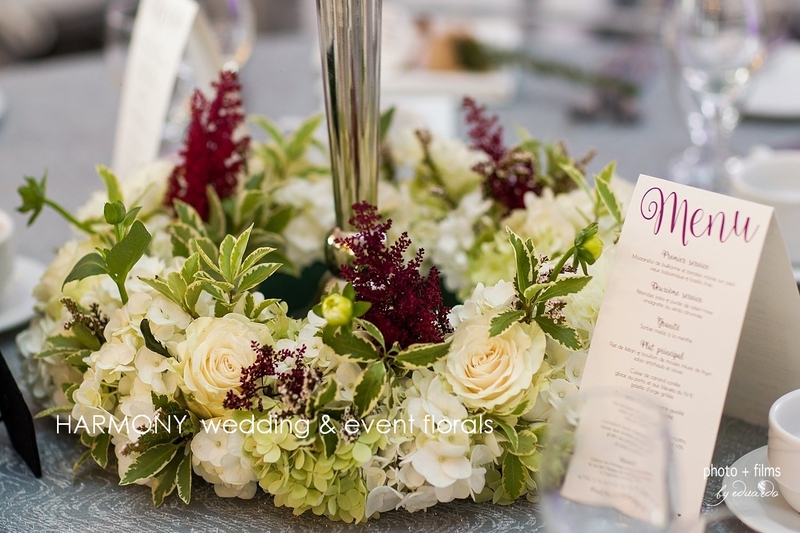 Wreaths filled with garden flowers wrapped around the silver candelabras. Lush cream hydrangea, dahlias, garden roses and garnet-toned astilbe surround a floating candle. 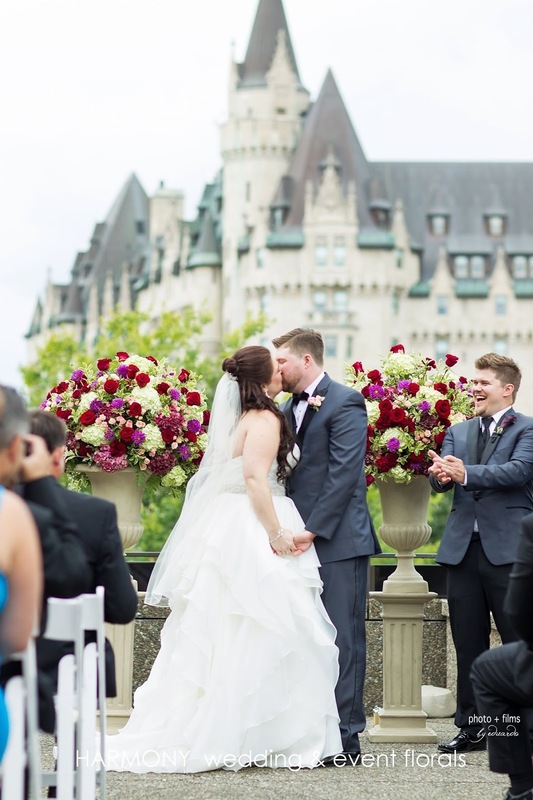 Their first official kiss as Mr & Mrs framed with garden urns filled with awe-inspiring flowers set against the backdrop of the historic Chateau Laurier. Perfection!!! 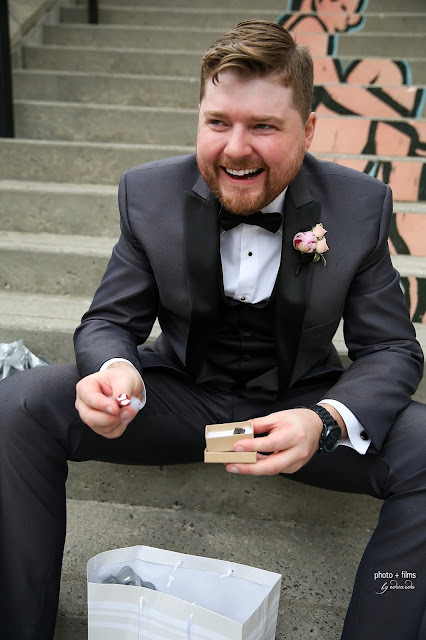 Congratulations to Chelsey and Peter - wishing you a life filled with love, laughter and many kind surprises! 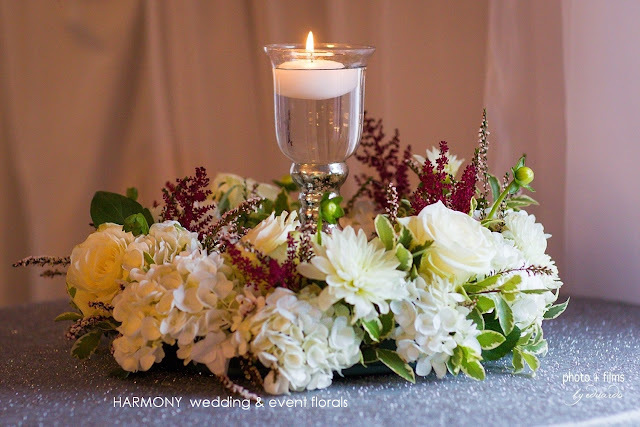 Thank you to Photo + Films by Eduardo for these wonderful images! 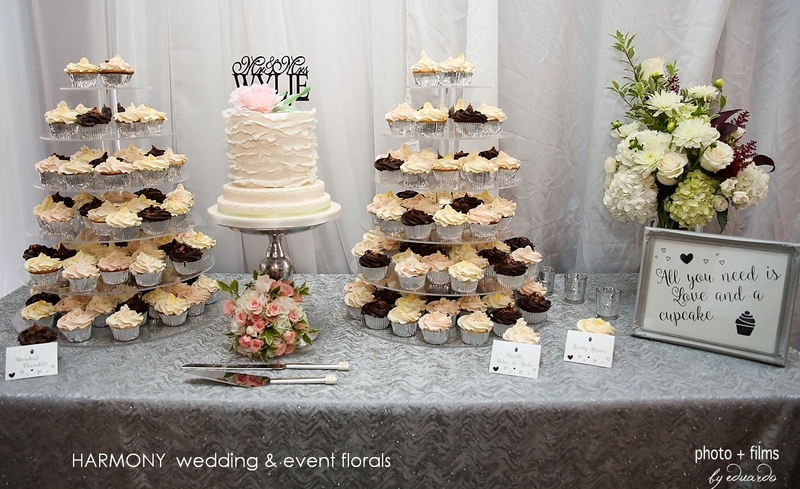 Just a little over 5 years since creating the wedding flowers for her sister Kali, Maddi married her groom, Blake in the historic Code's Mill in picturesque Perth, Ontario. It's a sincere and heartfelt honour to be a part of a family's celebration and when it happens twice, of course, it's doubly meaningful. Earlier in the week the Ottawa region experience a record-breaking snowfall covering the small town of Perth into an idyllic winter setting; perfect for these two lovers. 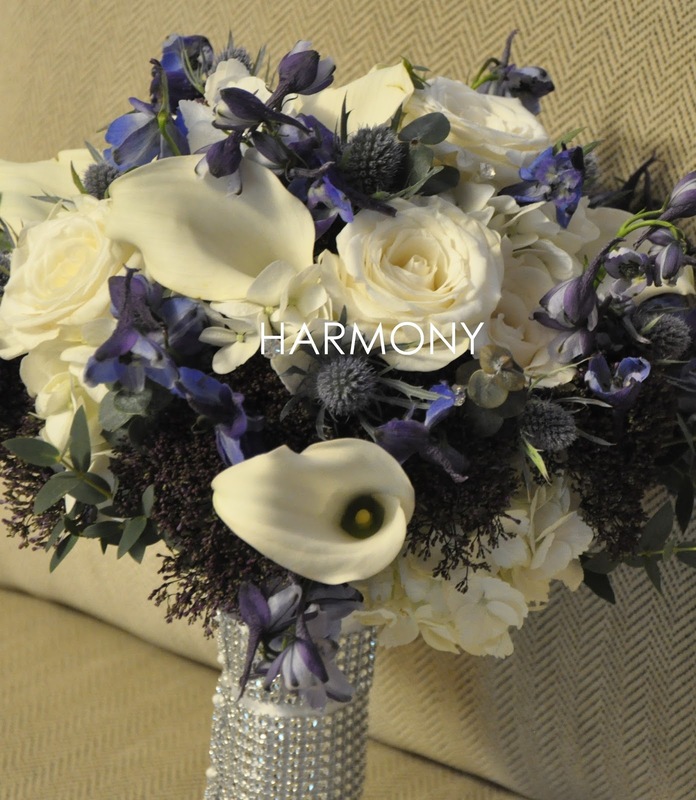 Working with a palette of navy, white and bling (lots of bling), Maddi's bouquet was created with callas, roses, delphinium and thistle all accented with rhinestones and blingy diamond ribbon. The Attendants were dressed in navy so we went with winter-elegant white roses and ranunculus all wrapped with silver ribbon. 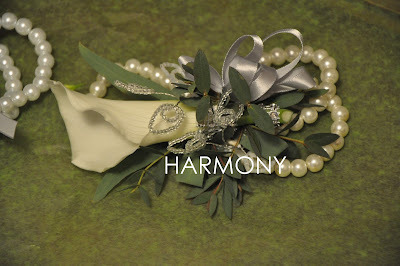 Simple but with some sparkle and the Mother of the Bride, and Groom pearl wrist corsages were done! 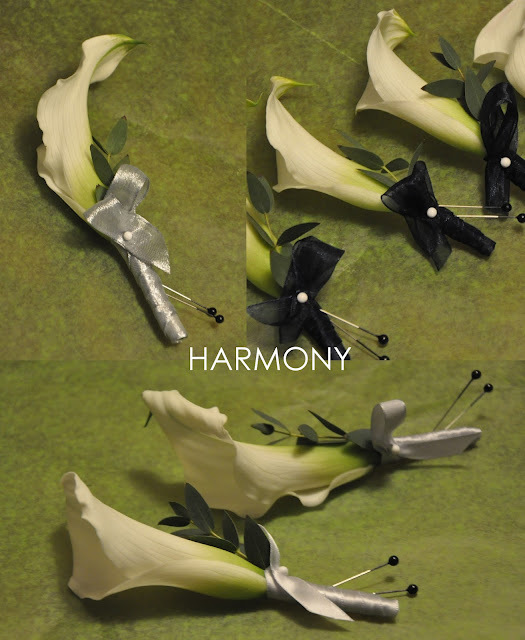 The gentlemen's boutonnieres were classic calla lilies with minimal extras; just a simple wrap of ribbon and a sprig of parvifoglia. Done! 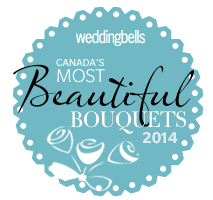 I am a wedding and event floral designer based in Ottawa, Ontario. 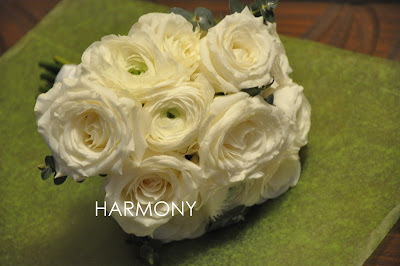 HARMONY opened in 2003 as a retail florist shop in Ottawa. In 2013 the decision was made to transition to a design studio focused solely on weddings and events allowing me to be dedicated to my clients and craft. It has been a joyful journey since 2003. Welcome to HARMONY.